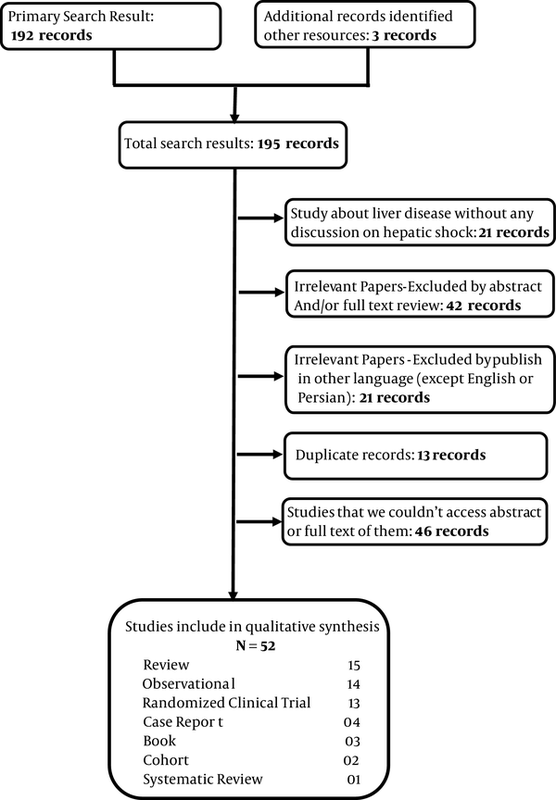 To Cite: Soleimanpour H, Safari S, Rahmani F, Nejabatian A, Alavian S M. Hepatic Shock Differential Diagnosis and Risk Factors: A Review Article, Hepat Mon. 2015 ; 15(10):e27063. doi: 10.5812/hepatmon.27063. Context: Liver as an important organ has a vital role in physiological processes in the body. Different causes can disrupt normal function of liver. Factors such as hypo-perfusion, hypoxemia, infections and some others can cause hepatic injury and hepatic shock. Evidence Acquisition: Published research resources from 2002 to May 2015 in some databases (PubMed, Scopus, Index Copernicus, DOAJ, EBSCO-CINAHL, Science direct, Cochrane library and Google scholar and Iranian search database like SID and Iranmedex) were investigated for the present study. Results: Different causes can lead to hepatic shock. Most of these causes can be prevented by early resuscitation and treatment of underlying factors. Conclusions: Hepatic shock is detected in ill patients, especially those with hemodynamic disorders. It can be prevented by early treatment of underlying disease. There is no definite treatment for hepatic shock and should be managed conservatively. Hepatic shock in patients can increase the mortality rate. Liver acts as the factory of bio-synthetics. It is the place of metabolism and clearance and the blood volume reservoir. Liver is the only parenchymal organ with dual blood flow, from portal vein and hepatic artery (1). “Shock liver” otherwise known as ischemic hepatitis is believed to be due to reduction in systemic blood flow as occurs in shock (2). Hepatocytes hypoperfusion that causes liver cell injury is classified as “ischemic hepatitis” resulting from hemodynamic instability and inadequate blood flow due to reduced hepatic arterial flow and/or passive venous congestion (e.g. Heart failure) and “hypoxic hepatitis” that results from hypoxic insults such as respiratory failure (3-8), this condition is also termed “hypoxic hepatopathy” (9, 10). Transient elevation in serum hepatic enzymes occurs following a hypo-perfusion state termed “shock liver” or “hypoxic hepatitis” (4, 10, 11). In most cases, liver dysfunction emerges without any noticeable changes in patients’ clinical profile (5, 12-16). Multiple mechanisms can cause hepatic shock including hemorrhage, major surgery, respiratory failure, infection and persistent shock. Failure of microcirculation, systemic inflammatory response and adverse effects of treatment in patients in intensive care unit are amongst other causes (9, 17). Different grades of liver shock vary from mild elevation of serum aminotransferases and bilirubin levels in septic patients to an acute onset of high serum liver enzymes after hemodynamic shock (9, 18-21). A decrease in albumin and coagulation factors is the pivotal laboratory finding. Although these parameters have low sensitivity and specificity, they emerge as a result of hepatocellular or bill ducts injury and widely used to detect hepatic injury. The incidence of liver dysfunction may be underestimated if traditional static measures such as aminotransferase or bilirubin only be considered. Dynamic tests such as indocyanine green clearance are useful for monitoring perfusion and global liver function. Liver function is not affected by aging processes (11, 22, 23). Elevation in liver enzymes and bilirubin can subside within days or deteriorate if persistent hepatic microcirculatory failure is present (9). Hypoxic injury to the liver is a reversible subclinical condition affecting at least 1% of critically ill patients (4, 18). Critically low levels of oxygen for metabolic processes cause hepatocellular dysfunction (4) and is frequently observed in critically ill patients (6, 9) and is associated with high mortality and morbidity (6, 19). Hypoxic hepatitis is detected frequently in intensive care units (6, 7). Most cases of hypoxic hepatitis occur following cardiac failure, respiratory failure and septic shock (8, 20, 21, 24, 25). ICU jaundice occurs latter in critical ill patients, especially after trauma and sepsis and the main relevant factor is conjugated hyperbilirubinemia (26). Presence and severity of jaundice are associated with increased mortality in non-hepatic ICU disease (5, 13). Ischemic hepatitis should be in mind in all patients with recent systemic hypotension. It should be in differential diagnosis of patients with unexplained hepatitis (10, 14). After ischemic event of liver, it is essential to maintenance the flow to the liver to prevent further hepatic injury. There are some intrinsic factors that support this circulation (11, 16). Hepatic ischemia and hepatotoxic effects of inflammatory mediators are the major etiologic factors for ischemic hepatitis. Massive blood transfusion, effects of nutritional support and drug toxicity may also contribute. The phagocytic action of kupffer cells subsides because of liver dysfunction, which permits systemic spread of endotoxins and inflammatory mediators able to cause multiorgan failure. There is no specific treatment, but early resuscitation and treatment of underlying causes (such as sepsis) and intensive care would likely reduce the incidence and severity of outcomes (17, 26-29). This can be achieved by stabilization of circulation parameters and cardiac output, control of infection, delicate control of mechanical ventilation and controlled administration of vasoactive drugs (9, 30-34). To gather relevant articles we used most reliable evidences about hepatic shock or ischemic hepatitis. At first we searched for systematic review articles, clinical trials, original articles, books and used reputable internet databases such as PubMed, Scopus, Index Copernicus, DOAJ, EBSCO-CINAHL, Science direct, Cochrane library and Google scholar and Iranian search database like SID and Iranmedex. We used keywords such as hepatitis, liver injury, shock, liver function disorder and ischemic hepatitis. Inclusion criteria for this study were all studies about hepatic dysfunction due to various causes such as hypoxia, respiratory disorders, circulation disorders, drugs, trauma and infection. Studies published in other languages except English, were excluded from our study. All studies were analyzed by authors and their quality assessed; unrelated articles or articles with low quality excluded from study (Figure 1). Our study had some weak points; it was a simple review article and when we could not access full or abstract of some articles, we excluded them from our study. Strong point of our study was describing a dangerous condition and its causes and treatments. The main causes of hypoxic hepatitis can be categorized as low cardiac output and septic shock, although a multifactorial cause was seen in most patients. Complications of hypoxic hepatitis are spontaneous hypoglycemia, hepatopulmonary syndrome, respiratory insufficiency and hyperammonemia (4). Four different hemodynamic mechanisms responsible for hypoxic hepatitis were recognized. In decompensated heart failure and acute heart failure, hypoxia of the liver is attributed to decreased hepatic blood flow (ischemia) because of left sided heart failure and venous congestion secondary to right sided heart failure. In chronic respiratory failure, liver hypoxia was the result of profound hypoxia. In toxic/septic shock, oxygen delivery to the liver is normal but oxygen needs are increased. In all cases, a shock state was observed in about 50% of cases (5, 27). There are multiple causes of low blood pressure, also called hypotension, which can lead to hepatic ischemia including: a) Abnormal heart rhythms, b) Dehydration, c) Heart Failure, d) Infection, e) Severe bleeding, f) Blood clot in the main artery to the liver (hepatic artery), g) Swelling of blood vessels leading to reduced blood flow (vasculitis) (25, 34). In critically ill patients, especially in intensive care units, shock liver has an incidence rate of 10%. This condition is triggered by hypoxic and/or ischemic events, most commonly cardiogenic shock and sepsis/severe shock. Other risk factors for shock liver for ICU patients are chronic liver disease and malignancy, iatrogenic factors such as TPN, high pressure ventilation, surgical procedures, drugs and blood transfusion (6, 35). Elevation of hepatic enzymes and liver dysfunction is common in critically ill patients. It can be detected in more than 50% of ICU patients (9, 23). Shock liver can influence the overall mortality rate in ICU patients (9). The mortality rate of patients with hypoxic hepatitis in cardiac intensive care unit is high and associated with ventilator disturbances (7, 11, 23, 36, 37). Acute and chronic heart failure are other risk factors for hypoxic hepatitis (4). In addition to hypotension, the low flow state secondary to congestive heart failure and hypoxia from sepsis or respiratory failure and hypoxemia are other causes (10, 24). In critically ill patients, therapeutic and surgical procedures can lead to liver dysfunction. Risk factors of liver dysfunction in these patients are administration of different medications, blood transfusions, immunosuppression, hemodialysis and parenteral nutrition (38). Respiratory failure is associated with liver dysfunction. In patients with respiratory failure, impaired liver function is less obvious. While liver dysfunction in critically ill patients leads to prolonged duration of ICU stay and increased mortality risk (39). In one case report by Szypowska et al. a 10-month old boy was admitted to hospital with pH in ABG = 6.8, body temperature = 39.9 C and blood sugar = 145 mm/L. Type 1 diabetes mellitus was diagnosed complicated by DKA (Diabetic Ketoacidosis) and otitis media. During the next 48 hours of treatment, glucose level and acidosis normalized. On the third day, laboratory tests showed a rapid increase in AST and ALT levels to 8000 and 6000 IU/L and INR = 2.9. A gradual decrease of transaminases level was observed on fifth day and during next weeks all liver function tests normalized. All viral infections and hepatotoxic agents were excluded. Diabetic ketoacidosis complicated by hypovolemic shock, infection and profound metabolic decompensation may lead to hypoxic hepatopathy in infants (22). Panne et al. determined the role of some of intrinsic factors such as CO and NO in control of sinusoidal perfusion, mitochondrial function and bile production in the isolated perfused rat liver after hemorrhagic shock. Their study indicated that endogenous CO preserves sinusoidal perfusion after hemorrhagic shock and can limit shock induced liver dysfunction, but in contrast to CO, NO has only minor role for the intrinsic control of ischemic hepatitis (40). Harbrecht et al. studied the role of inhibition of NO synthesis in hepatic injury due to decompensated hemorrhagic shock in a rodent model. They determined that NO synthesis serves protective role in preventing hepatic injury and modulation of the local hepatic circulation (41). Fu-Chao Liu et al. studied the protective effect of Tropisetron on rodent hepatic injury due to trauma-hemorrhagic shock. Tropisetron can alleviate organ damage. They attempted to show whether P38 MAPK/HO-1 plays any role in the tropisetron-mediated effect to reduce hepatic injury. Rats in traumatic-hemorrhagic shock state were studied. They showed that trauma induced hemorrhage, increased plasma concentration of aspartate aminotransferase (AST) and alanine aminotransferase (ALT), hepatic myelotransferase (MPO) activity and so on. Troposonin can improve these parameters in rats with trauma-hemorrhage (42). Furthermore, Hurt et al. (43) studied hemorrhage induced hepatic injury and hypo-perfusion and the role of direct peritoneal resuscitation in injury prevention. Hemorrhagic shock decreases hepatic blood flow and causes liver injury (focal to sub-massive necrosis), tissue edema and elevated liver enzymes (AST and ALT) in rats with hemorrhagic shock, which needs treatment with conventional I.V fluid resuscitation. In the other side, rats with hemorrhagic shock that received 30 mL intraperitoneal saline other than conventional resuscitation showed minimal hepatic injury (43). Champion HR. et al. investigated clinicopathology of hepatic dysfunction following shock. They studied 19 patients with profound hypotensive shock. Immediately after shock, there were evidences of hepatic cellular enzymatic and microscopic damage. Bilirubin rise and jaundice occur on 8 to 10 days after the shock episode. Then it was followed by repair and regeneration of the liver. Recovery of hepatic function could be continued or delayed by concomitant disease like systemic infection (44). Liver defense mechanism and metabolic action are thought to be affected during sepsis. Early hepatic dysfunction is related to hepatosplanchnic hypo-perfusion and occurs in the first hours of sepsis. Liver damage is because of high splanchnic oxygen demand and high O2 consumption because of hepatic hyper metabolic stat during sepsis. Prevention and treatment of sepsis induced multi-organ failure is achieved by restoring normal micro-vascular circulation. The usefulness of goal-directed therapy on micro-vascular circulation is under debt. Some therapies that aim endothelial cells and relate to inflammatory and coagulation pathways might reduce microcirculatory failure. Stress doses of corticosteroids can improve host defense and reduce bacterial colonization during endotoxinemia (45). In another study Da et al. administered hydrocortisone and inhaled NO, which reduced the inflammatory response and restored normal liver morphology (46). However, there is no definite conclusion about steroid treatment in clinical sepsis and septic shock (47, 48). In a case report by Dang et al. (49) in the National Institute of Infectious Disease in Tokyo, a 10-year-old boy was reported with three days headache, fever and gastrointestinal and urinary bleeding and generalized petechia and hepatomegaly. The diagnosis was Dengue shock syndrome (DSS). Laboratory findings showed increase in hepatic enzymes and bilirubin. Total bilirubin = 6.9, direct bilirubin = 3.9, AST = 3507 IU/L, ALT = 2775 IU/L, Prothrombin time 43 seconds (INR = 3.4) and partial thromboplastin time 93 seconds. Serum had positive result for DENV IgM. In liver ultrasonography, they found totally reversed direction of portal venous blood flow away from the liver that became bidirectional in following days and finally changed to normal flow pattern (49). Jaundice after surgery is documented in approximately 1% of postoperative, non-cirrhotic patients and subsides in few days. The underlying causes are blood transfusion, hematomas, G6PD deficiency, sickle cell anemia, infection and Gilbert syndrome. These causes only increase unconjugated bilirubin. Increase in conjugated bilirubin and transaminases level more than 5-folds shows hepatocellular injury present in hepatic hypoxia, drug induced hepatitis and viral hepatitis (5). Einollahi et al. reported non-viral related liver enzymes elevation after kidney transplantation. In this study, ALT was mostly elevated amongst liver enzymes in kidney recipients. Enzymes elevation was especially within 3 months of transplantation (50). Mohseni et al. (51) studied the effect of volatile anesthetics in ischemic liver injury. The pathophysiology of liver injury in patients undergoing anesthesia with halogenated anesthetics is due to their metabolism to trifluoroacylated which is hepatotoxic. Also the damage can be due to decreased cardiac output and total hepatic blood flow when using volatile anesthetics (18-20, 48, 51). Reduction in hepatic blood flow in traumatic patients due to hypotension, release of catecholamines, increased intra-abdominal pressure, central venous feeding and administration of various drugs (specially drugs with hepatic metabolism) can lead to liver dysfunction. Traumatic patients are at risk of liver dysfunction and usually older and are in shock, thus requiring multiple blood transfusions (52). Therapeutic strategies in these patients include infection control, establishing adequate tissue perfusion, use of mechanical ventilation, administration of catecholamines and metabolic monitoring. In the recent years, Fenoldopam in patients with hemorrhage has been recommended to maintain blood flow and reduce visceral ischemia membranes (directs the blood flow from the serousal tissue to visceral mucus). Also in patients with heart failure and septic shock, dopamine (due to the vasoactive effects of it) is administered to maintain blood pressure in the normal range. The lower doses of dobutamine to maintain mucosal perfusion and hepatic blood flow are administered. Reduced oxygen consumption by the organ during the administration of dopamine has been reported in patients with severe hepatic failure. Also, higher than normal doses of steroids may reduce the need for norepinephrine in hypotensive patients with liver failure. All mentioned items have no effects on patient’s survival, but can keep patient’s life to find a transplant liver. The use of multiple therapeutic agents such as N-acetyl cysteine, albumin, hemodialysis and Molecular Adsorbents Recirculating System (MARS) are presented as advanced therapies, but the only definite treatment of these patients is liver transplant (5). Liver as an important organ in the body has a vital role in physiological processes. Liver function such as other organs is dependent on blood circulation and preparing the hepatic cells needs. Hepatic shock is also known as shock liver, ischemic hepatopathy or hypoxic hepatitis, which all have the same pathophysiology causing hepatic ischemia or hypoxia. Shock liver is characterized by elevation of hepatic enzymes either transient or persistent because of hepatic cellular injury. This rise in hepatic enzymes is subtle most of the times, but researches have shown some cases with high enzyme levels. It is detected frequently in critically ill patients, especially ICU patients. There is no specific treatment for hepatic shock, but it should be in mind in all ill patients and can be prevented by early resuscitation and treatment of underlying causes. Authors’ Contributions: Study concept and design: Seyed Moayed Alavian and Hassan Soleimanpour; drafting of the manuscript: Saeid Safari, Farzad Rahmani and Arezu Nejabatian.